to us. Please send your recommendations. Thank you for inspiring us with your testimonials. * These services are provided by third party administrator and facilities. Please, contact us at 804-477-5321 for further information. 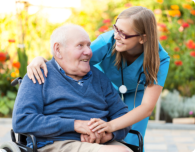 A registered nurse from CAREGISTICS will visit you at home for a consultation. CAREGISTICS has been in the home health care industry for many years and have been renowned for our excellent services. We work well with patients, family members and other healthcare professionals. We recognize ourselves as part of the multi-disciplinary team that must function harmoniously in order to achieve the client’s best of health. We know and understand everyone’s need for exceptional care at home. With medically fragile health conditions, you know you can only entrust your loved one to capable professionals. We hope you will find those professionals in the CAREGISTICS staff. We are prepared to face your health care challenges with you! Call us today at CAREGISTICS for inquiries on how to get started with home health care. CAREGISTICS will bring outstanding health care services to our clients who are homebound with illness, disability or old age. We give our level best for you to experience a smooth recovery under the care of our nurses, therapists and home health aides.